Russula pectinatoides is not the easiest of the foetid russulas to identify, but it has several features that help to distinguish it. 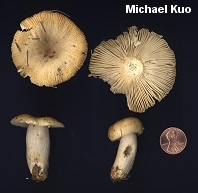 I look for the relatively pale, straw colored cap; the lined and pimply ("tuberculate-striate," in Mycologese) cap margin; and the presence of small, pinkish to cinnamon spots in the vicinity of the lines and pimples. 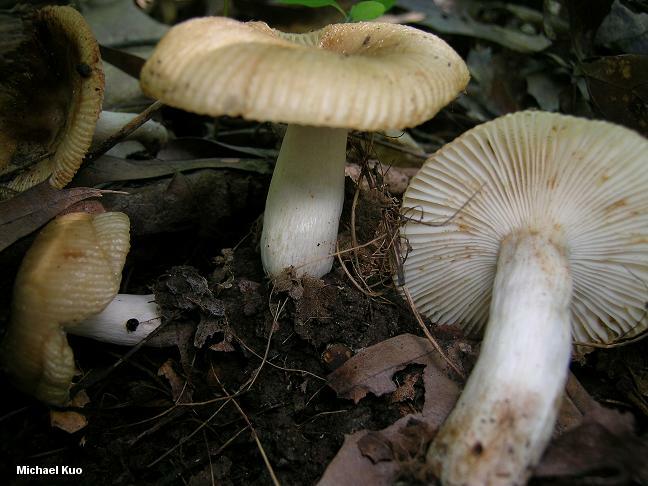 The taste of Russula pectinatoides is mild or slightly acrid, and its odor is a mild and waxy version of the maraschino cherry smell that typifies the foetid russulas. 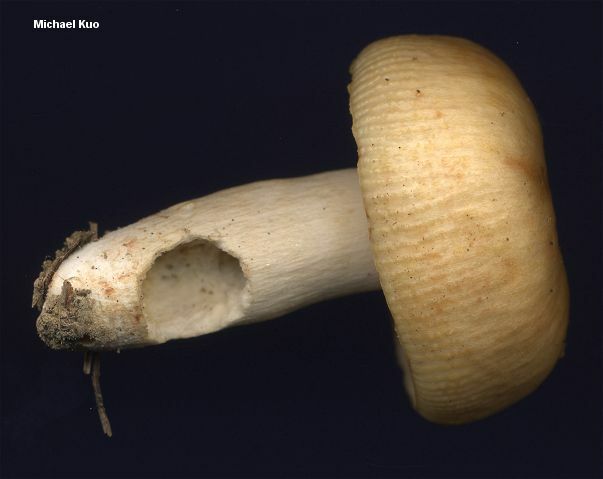 Additionally, Russula pectinatoides is more fragile than many of its close cousins. A look at spore size and ornamentation will help confirm your identification. Ecology: Mycorrhizal with hardwoods or conifers; growing alone, scattered, or gregariously; summer and fall; widely distributed east of the Great Plains. Cap: 2.5-8 cm; convex, becoming broadly convex to flat with a shallow depression; slimy when wet and fresh, but typically dry when found; pale yellowish brown to brownish yellow overall; the margin lined and pimply for 1-2 cm, often with tiny spots of pink or cinnamon interspersed with the lines; the skin peeling away easily, usually at least halfway to the center. 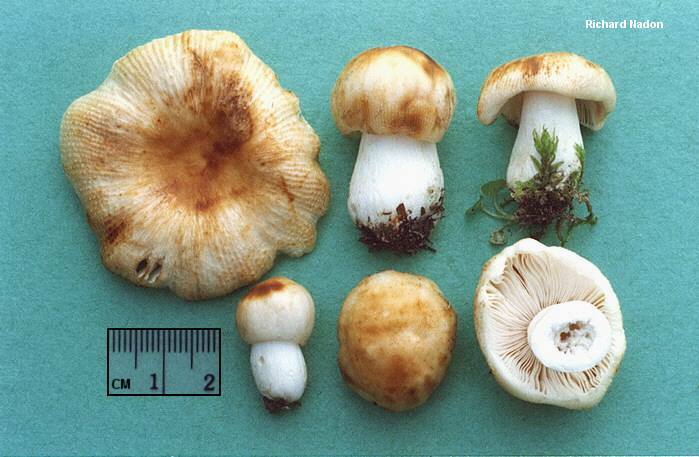 Gills: Attached or pulling away from the stem; close or nearly distant; buff or yellowish; sometimes spotting or discoloring brownish. 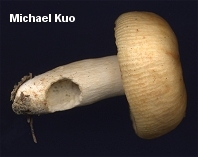 Stem: 1.5-7 cm long; .5-2 cm thick; whitish, discoloring yellowish to brownish or reddish brown; often becoming cavernous; more or less smooth. Odor and Taste: Odor weakly to moderately reminiscent of maraschino cherries, almonds, or benzaldehyde, with a waxy or spermatic component; taste mild or oily, sometimes a little acrid. Chemical Reactions: KOH on cap surface negative to very pale magenta. Iron salts on stem surface negative. 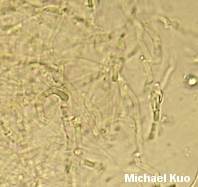 Microscopic Features: Spores 5.5-9 x 4.5-6 µ; broadly elliptical; with warts up to 1 µ high, and sparse to nearly absent connectors. Pleurocystidia positive in sulphovanillin. Pileipellis an interwoven cutis of mostly hyaline elements, embedded in a gelatinous matrix; pileocystidia absent. REFERENCES: Peck, 1907. (Burlingham, 1915; Kauffman, 1918; Shaffer, 1972; Weber & Smith, 1985; Kibby & Fatto, 1990; Phillips, 1991/2005; McNeil, 2006.) Herb. Kuo 05310401, 06010404, 07270402, 08010404, 06270801.